Here in the Ludington area, we have a LOT of "Great Outdoors!" We take pride in our miles of beautiful beaches, the Ludington State Park, the Manistee National Forest--and all the activities that take place in Mother Nature's playground. 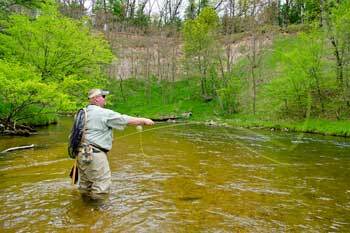 Golfing, fishing, boating, hunting, biking, and endless winter activities--the fun is endless, all four seasons of the year. Fresh, clean air and the great outdoors of West Michigan--it doesn't get any better than this. What could be more enjoyable than a day at the beach? If your idea of a perfect summer day is swimming, sunning, or people-watching, then you've discovered paradise. Pretty parks are scattered throughout the region--some along the lakeshore--others among wooded regions. Most parks have picnic tables, grills, and playgrounds. 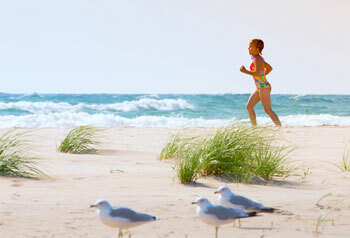 Read more about Ludington area beaches and parks. The Ludington area has many safe and scenic areas in which to bike. You can choose to ride along the downtown waterfront, bike through a wooded forest, or take a trip out to the Ludington State Park. Either way, you'll enjoy fresh air, exercise, and wonderful views. Read more about West Michigan bikes and trails. 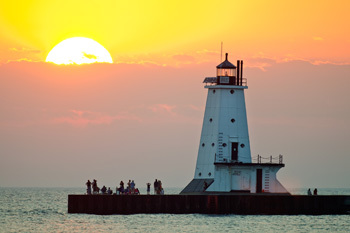 Lakeshore communities are blessed to have historic and beautiful lighthouses, and here in West Michigan, you can visit these structures, which includes the North Breakwater Light and both Little and Big Sable Point. It's the #1 State Park in the Midwest, and here's why! Campgrounds, lighthouse, dam, beaches, hiking and biking trails and informative summertime programs give visitors so much to do. 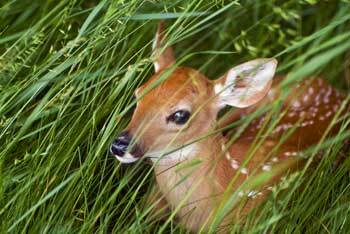 Woods, water, wildlife...you'll find it all at the Ludington State Park. Beautifully landscaped golf courses are plentiful here in West Michigan. Swinging a golf club is relaxing and great exercise, and when you've got fresh air and gorgeous surroundings, why wouldn't you want to head out on the links? Disc golf shares many similarities with traditional golf, but instead of a ball, players toss a disc down a course and try to get to the target in as few throws as possible. The winner is the player who completes the course with the lowest score. Whether it's fishing for salmon on Lake Michigan, trout in the PM River, or walleye in Hamlin Lake--we've got the best variety here in Ludington. And local tournaments give anglers a chance to add a little money to their pocket in addition to the fish in their bucket. 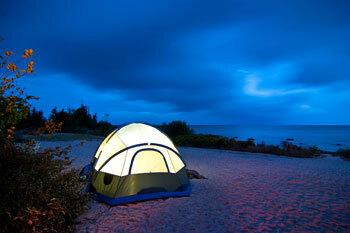 Camping is becoming a very popular activity for families and couples. It's inexpensive, and with all the forests and natural woodlands in West Michigan, there's never a shortage of campgrounds. Nothing is better than sitting around a campfire with those you care about and enjoying all the activities within the campground; such as swimming, biking, hiking, and fishing. Life along Lake Michigan, with its often windy conditions, makes for some fantastic dune formations. 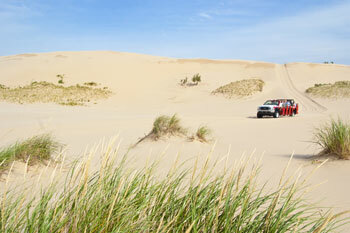 Ride the dunes at Silver Lake for a thrilling experience--or enjoy the quiet solitude of the Nordhouse Dunes. Strategically planted dune grass helps keep the sand in place, ensuring that these dunes will survive for thousands of years to come. Autumn is one of our most beautiful seasons here in West Michigan. The trees turn glorious colors, and the landscape is awash in golds, reds and oranges. Driving down one of our back roads is both relaxing and pleasing on the eye. There's no need to hibernate during the winter months in West Michigan-not with all the great outdoor activities that use the snow for fun! For those who love snowshoeing or cross country skiing, you won't have to travel far to enjoy your sport.